Another exciting meeting of minds and styles in the shape of Tandem Series 6. The final release in the Tandem Series sees Taborshell and Sektor producing a split offering of 8 beautifully crafted tracks, rounding off the series in style. "Boltfish Recordings' Tandem series has been a worthwhile idea; combining the talents of two, usually very different, artists into an album's worth of material. 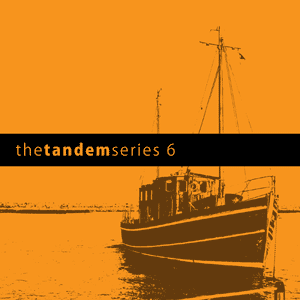 'Tandem 6' is the latest and the last release of this kind but still proves to be a fruitful listen. This time Taborshell from London is paired with Bulgarian artist Sektor. With track titles such as 'Humans Are History' and Robot Reality' Taborshell suggests that he believes in the space future a little too much but beneath the often coarse sounds lies some smooth melodies that proves a beating heart lurks beneath the technology; indeed, his final offering - the cool glistening Man Magnificent' - is particular riveting. Meanwhile, Sektor begins like a run-of-the-mill Boards Of Canada imitator but it turns out to be just one of the strings to Plamen Marinov's bow, in which 'Kikish' impresses for its shuddering rhythms and bouncy tune and 'Ekol Iton' builds a decent space-filled atmosphere. Finally, for those undecided as to which Tandem release to try out, a boxed set now collates all six albums in one handy package." "Taborshell contributes with four tracks saturated with nostalgia and big drums. Soothing electronica all around with some sonic trickery sprinkled ontop. Track 3 "Intelligence Idolised" stands out, with its excellent beats, build-up and surprising turn. The other artist contributing to this split goes by the name of Sektor. The four tracks by Sektor are good and they all contain healthy doses of beats, bass, structure fused with atmospheric elements cementing the feeling of enjoyment and very much a Boltfish affair." "The sixth and final instalment of the highly engaging ‘Tandem Series’ ... sees Hoxton based Chris Massey AKA Taborshell going head to head with Plamen Marinov better known to the IDM underground as Sektor. Eight tracks - 42 minutes of sumptuous electro pirouettes await inside, each artist asserting their bid for your affection with four cuts each. It’s not until the passage of the later brace of cuts ‘Intelligence Idolised’ and ‘Man Magnificent’ that you realise that Massey isn’t as new age as you’d first come to expect. Culturing alien circuitry binary code communications with a sense of classic song structures his finite arrangements of looped glitches, beats and whirrs stutter and momentarily pause arcing to deliciously craft an alluring backdrop of intricate rhythmic structures with slow building in stature ‘Intelligence Idolised’ creating a kind of calm before the storm entrée for the Kraftwerk-ian ’Trans Europe Express’ like ’Man Magnificent’ to work its charm. With its cavernous interludes and ceramic Far Eastern like accents it makes for a magnificent sonic portfolio of lushly vibrant landscapes that trip somewhere between the realms of frosted elegance and celtic serenity. Elsewhere ’Robot reality’ does as it says on the tin, decorated with a sense loss, alien in texture and glitchy in delivery its braided with untutored restless beats that skip and hop upon a surface sheen of glacial swathes. ’Humans are History’ perhaps the most expansive thing here courts with an engaging warmth that unless I’m very much mistaken to these ears appear not dissimilar it has to be said from a seriously chilled out d_rradio which as you should all be to aware of is a god thing. Sektor on the other hand provides a - dare we say it - more frisky alternative to Taborshell’s four part suite. Better known as Plamen Marinov - he’s been the toast of the IDM scene since putting aside his DJ head phones and moving into making his own electronic music rather than playing others - a handful of releases under his belt for the likes of Camomille, Tonaton and Uran97 have seen his stock rise. Four tracks feature on his side of the split forming as were an extended suite, beautifully worked cosmic interplays, lightly toned with the emphasis on curvaceous starlit melodies that smoulder and seduce in equal measure, from the high altitude pastoral pines of the delectable ‘ekol iton’ with its softly stirring gaellic accents to the glacial amour of the lilting lunatic pirouettes of the dreamy ‘ilohi teshel’ with it’s Biosphere like sense of presence. Elsewhere ‘kikish’ is part Clangers crafting sonic apparitions from celestial beaches bathed by alien moons - quite beautiful stuff if you ask me." "Lo-fi but heartfelt IDM. Taborshell’s pieces are especially beautiful, reminding me of the good old days." 4 out of 5. "Music on the Boltfish label is music with rhythm and these three bands are no different. On something called the Tandem series they offer two artists on one release, the sixth and last installment being Taborshell and Sektor. The first one is Chris Massey, relatively new to creating music, since last year. He likes to use 'destruction, experimentation and re-composition', but I must admit it's a bit unsure how that works in his four tracks. He claims that they aren't 'complete', but they sound complete to me. Broken beats, quite forceful, doomy synth lines, dubby sound effects. Quite nice, even when no big surprise. Behind Sektor is Plamen Marinov, who has released on Tonatom, Uran97, Canomille Music and Kahvi. More or less he works in a similar musical territory as Taborshell, but his rhythm section is less crunchy and his synthesizers more spacious and melodic. Minor differences, but no doubt in this world big ones. Both are quite nice. " "The 6th and final installment in Boltfish's excellent Tandem series comes from Taborshell and Sektor... 2 artists that I'm not that familiar with but I believe are active on the netlabel scene. Between them the've deliver 8 tracks (4 each) of purist Electronica of the variety that Boltfish are so good at releasing. There are elements of melody and beauty as well as a phatness to the rhythms that owes a debt to Electro and even Techno at times. Crunchiness prevails, however, with a more processed sound to the rhythms that works a treat. Although both artists share a style they have more than enough individuality to keep it going for the whole CD. In essence, another fab release from this great home-grown label. Recommended."